Who better than Australian Pork, to take porky advice from? Pork doesnt need to be overcooked to be safe. In fact, pork can be eaten with a hint of pink in the middle (with the exception of mince and sausages). Pork (like all meat) continues to cook after removal from heat. For best results, let your dish rest uncovered for 1-2 minutes in a warm environment prior to serving (except for sausages and mince). Always cut meat across the grain to keep tender. Avoid frequent prodding of the meat while cooking. For best results, meat should be brought to room temperature prior to cooking. Marinating can add extra flavour and tenderness, especially on the BBQ. 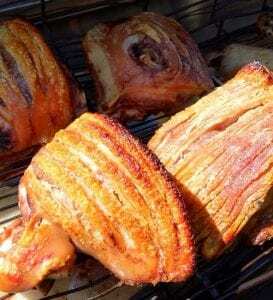 Find Pork recipes, more tips and tricks and pork-related News here!